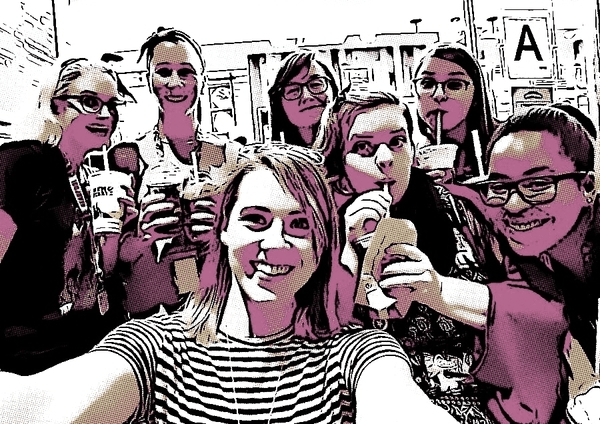 On Friday, Heather Antos‏, a Marvel comic editor who just happens to be a woman, tweeted a selfie featuring her and a bunch of her female co-workers enjoying some delicious beverages together. “It’s the Marvel milkshake crew!” she announced to her Twitter followers. She was immediately swarmed by a squadron of fanbabies furious that such “fake geek girls” had made their way into Marvel’s inner sanctum. to a slew of more garbage tweets and DMs. For being a woman. In comics. Who posted a selfie of her friends getting milkshakes. What's sad is that Marvel is pushing a feminist agenda. "Yeaaa I'm a woman! Look how much of a man I can be too!" This is why marvel comics is killing the industry no one wants to be fem moaned feminist propganda in a superhero comic. Maybe Marvel should just close shop. I'd rather that than see them lose their dignity for a Marxist agenda. But now that Marvel Comics is run by white knighting old men and garbage SJW millennials, no one wants to read their dumpster fire comics. One fellow wrote out a mini-manifesto explaining how the eeeevil SJWs were destroying comics. The critics filled their angry tweets with an assortment of buzzwords that will be instantly familiar to anyone who followed GamerGate. Remember when comics were about superheroes and not a safe space for feminists to create female characters who constant reassure each other? Third wave feminists and SJWs have poisoned Marvel, there's a reason those books are left on the shelf, people aren't buying the narrative. Not that the fanbabies didn’t have their own “narrative” to promote. One of the central tenets: that so-called SJWs only pretend to like comics. Is it any wonder than that when you only cater to people who only pretend to like something, that you don't see good sales numbers? Some saw the all-female selfie as a threat not only to men but to … white people in general, predicting an imminent White Genocide of Marvel characters. Diversity for #Marvel Comics means get rid of all White Men. In 5 years the only white characters @Marvel will have will be a bunch of ever increasingly stupid alternate reality versions Gwen Stacy. It didn’t take long for things to get creepy. Naturally, the reactionary fanboys turned on those who offered solidarity to the Milkshake Crew. #makeminemilkshake is another deflection tactic so that SJW Marvel creators can avoid accepting criticism. The Milkshake White Knights are a parade of nitwit SJWs who think they're legit marching on Selma or something. Jack Kirby was medevaced for frostbite from a combat zone. Female Marvel editors claimed harassment and then the hashtag was started just to virtue signal for them. The manufactured harassment narrative has become PR. The pain of others is a product sold to virtue-signaling morons. We’re not a monolith though. Even within our own countries. We have anti-communism and conservatism to thank for that. We’re still plagued by the poisonous ideologies left behind by fascist dictators and their fact-resistant hordes of idiots. Someone should tell them about Kepler-16b. Ah hah! I could load up my index of several hundred videos on agroforestry, watershed management, fighting desertification and other exciting goodies, but I won’t. Ethiopia. Abaháui – The Father of Fire. The Abaháui, Wangari Maathai and Hiware Bazar videos show what can be done when one outstanding individual inspires a village or a region – and even earn a Nobel Peace Prize in Wangari Maathai’s case. The China example is of terra-forming on a massive scale – the landscape of the “project” is the size of Belgium. One thing to note about the China and Ethiopian govt run projects – they can only get the population fully involved when they finally, _eventually_ realise that nothing will get done without changing-granting land rights. If you hunt around for videos on India, particularly the Maharashtra region, for watershed management, you might like to think about the approach of WOTR – started by Father Hermann Bacher. They don’t just get everyone involved in building check dams, they make damned sure that women are empowered by-during the process. Very different from Maathai’s approach, but different strategies for the same ends. Whatever you want to do about culture-religion-social structures, there’s a couple of examples of combining hard physical work with literacy and other social change. Reacting to Marvel Milkshake pic, DC posts pic of many of the women working at DC. Marvel posts pic back of milkshake with 2 straws. I know almost nothing about south american politics, but I have heard a nice song about them… Junta! The musical. As a long-time Marvel fan, I will never understand why these individuals would have ever read Marvel comics, and I somewhat suspect that many of them never did. Marvel has always been quite progressive for a comics publisher. I mean, Black Panther and the African nation of Wakanda – the most advanced country on Earth in the Marvel universe – were introduced back in 1966! How progressive is that? Northstar, an openly gay superhero and mutant, has been around since 1979. Storm, a black woman, led the X-Men for a while back in the ’80s, and has been team leader several times since then. And M aka Monet, a mutant heroine who was introduced in 1994, is a Muslima. Granted, she’s not particularly religious (unlike Dust, an Afghani mutant girl who joined the Xavier’s school in 2002), but she’s still an example of the diversity that has always been part of the Marvel universe. Needless to say that Marvel’s writers have always strongly condemned racism and other forms of prejudice, bigotry and discrimination against minorities in their stories. There may have been unconscious biases on display in past decades, but Marvel has never catered to the misogynistic, homophobic white supremacist crowd. And until a few years ago, I’ve never heard this choir of complaints about alleged “SJWs” with scary agendas in the comic book industry. I have a hard time believing that these types have ever been actual Marvel readers and fans. A lot of my peers are starting to get attacked and harassed. Do we have any actual ways to stop gamergate? There are tons of female created comics especially depending on how you parse things. DUMB by Georgia Webber is a great comic about coping with a disability. KORRA coming out through Dark Horse has female editors, and Irene Koh (line artist)& Vivian Ng (colorist) are working on it. I mean that is an absolutely small start and I can keep going if you need me to, but I can make it more targeted if I have your taste in comics.